Right on Napili Bay Beach! You'll love being right on this gorgeous white sandy beach.You'll see from the photos we have a fabulous view of the ocean and the beach. We have a queen bed and also a queen sleeper sofa allowing us to accommodate up to 4 people quite comfortably. Our flat screen TV has a built in DVD player, you'll also find an ipod doc and CD player, and FREE WIF INTERNET SERVICE. Right next to our lanai table and chairs you'll find beach chairs. We've provided all the standard amenities one would expect in a vacation rental and then a bit more to accommodate our passion for cooking. 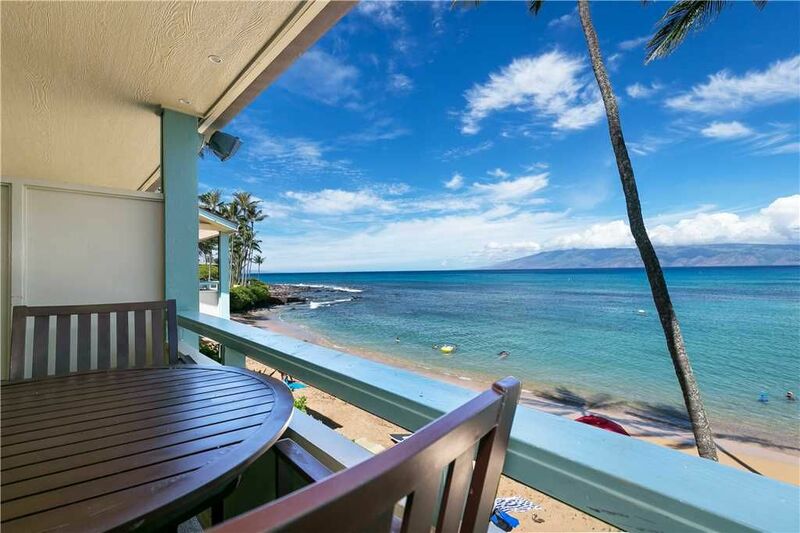 Our on island licensed management company MAUI BEACHFRONT RENTALS has been servicing our guests for over 20 years. We take great comfort in knowing our property is being managed by a team of professionals that offer full services to our guests throughout the duration of their stay.. Services available to you include car rentals, discount airfares with Hawaiian Airlines, concierge services for all island activities, assistance with any childcare needs or assisted living needs in addition they offer advanced grocery delivery service. On property you will find a coin operated laundry facility in addition to a very charming picnic barbeque area that has gas grills and picnic tables for outside dining. There is no swimming pool here, however you have one of the best beaches on Maui right at your front door. Kapalua Resort is just a block away with two championship golf courses and 23 lite tennis courts. Not to mention you can visit any of the three additional white sandy beaches along the way. It's a delightful stroll along the beach to The Seahouse Restaurants conveniently located directly at the north end of Napili Bay Beach. Don't miss it! We hope you'll visit soon and often! There is no better place in the world to enjoy a morning coffee or an evening mai tai than on a lanai overlooking Napili Bay! We found this location to to be the perfect blend of location and affordability, and could not have asked for anything more. The room was clean, cozy, and well supplied, and the view was always pristine! If we are ever fortunate enough to again spend time on Maui, you can bet that we will be staying here, building sand castles within arms reach of the door and getting lulled to sleep by the surf! No better place in the world to enjoy your coffee, you say? Wow, well, we don't disagree. :) You hit on the all the main points that make this unit and property great. We appreciate you being our guest, and hope you do return again soon. Mahalo! This place was steps from the beach! Quiet, clean, secluded , easy parking , amazing views! Saw Honu ! It was hot, no AC ,but this is the Islands so it’s supposed to be warm—-& there were fans to help w/ airflow. We will definitely stay again!! Short drive to restaurants, shopping , etc. amazing place! Mahalo for an epic vacation !! Thank you for your kind review, Tamara. There are indeed some amazing views not just from this unit but the beach as well. We're so glad you had such a great stay. Please do make good on returning again soon. Thanks for being our guest! thank you for the accommodation. the pictures did the place justice and were not misleading. Clean place with great view. The full kitchen was awesome. Thanks for your kind review, Nick. Indeed, we try to make sure we have the most up to date pictures possible of our condo, and we're glad you noticed. It was our pleasure having you as a guest, and we hope you do consider a return again in the future. Mahalo! It's a beautiful spot on Napili Bay with enough close by to keep one happy and we saw whales every day. But the lack of ability to completely close off the waves and people talking along with slow wifi, small tv, no counter space, & very average bed, we would not return. If we were a lot younger or this unit was half the cost, this might work but we're older and spoiled. A mattress topper, thicker cushions on the lanai furniture along with a bigger TV would be big and easy improvement. Thanx. Ideal location. The Lanai had an amazing view. Excellent value. The only negatives of our stay was that the large burner on the stovetop would intermittently turn off, and we could not figure out how to consistently get cold water. The kitchen could use just a bit of an upgrade, but really, overall, we made it work. Thank you for your review, Melissa. We pay close attention to see what we're getting right and where we can improve. We will definitely look into resolving both of those issues you ran into, being the burner shutting off and not getting cold water. We appreciate you bringing this to our attention, and are glad it didn't seem to impact your vacation. It was our pleasure having you as a guest and we hope you do make good on returning again! Mahalo! You took great care of us on our recent stay at your condo. Getting this vacation booked with you, getting checked in and out, was all made easy on us. We enjoyed your unit tremendously. You take great care of your place and it shows. We also loved the quiet locale and the beach being always just a few steps away. Thank you for providing us these awesome accommodations. We are hoping our touch of paradise will get us through another cold Chicago winter. We appreciate the positive review, AK. We definitely shoot for making the whole reservation process as easy on our guests as possible. We're so glad you had such a great experience, and we do hope you come visit again.